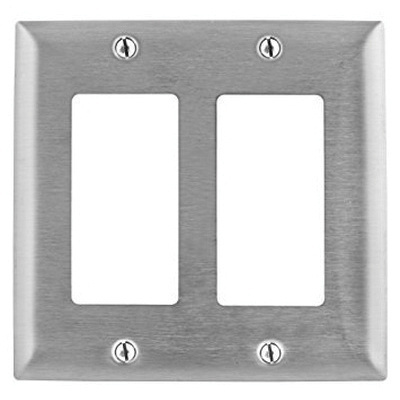 Hubbell-Wiring HomeSelect® 2-Gang Standard size wallplate in stainless steel color, features 302/304 stainless steel construction with lacquer coated finish. Wallplate with two decorator configuration, fits industry standard rectangular GFCI style openings and suitable for use in highly corrosive environments. It is UL94 V0 flammability rated to withstand harsh environmental conditions. Wallplate is UL listed, CSA certified and meets ANSI/TIA/EIA standards.